“Survival of the Richest”: Trump’s Plan for “Making America Great Again”! …The bottom 90% are the lucky owners of about three-quarters of the country’s household debt. Mortgages, auto loans, student loans, and credit-card debt are cumulatively at a record-high $13.5 trillion. As the animals of Orwell’s farm grew ever less equal, so in the present moment in a country that still claims equal opportunity for its citizens, one in which three Americans now have as much wealth as the bottom half of society (160 million people), you could certainly say that we live in an increasingly Orwellian society. Or perhaps an increasingly Twainian one. After all, Mark Twain and Charles Dudley Warner wrote a classic 1873 novel that put an unforgettable label on their moment and could do the same for ours. The Gilded Age: A Tale of Today depicted the greed and political corruption of post-Civil War America. Its title caught the spirit of what proved to be a long moment when the uber-rich came to dominate Washington and the rest of America. It was a period saturated with robber barons, professional grifters, and incomprehensibly wealthy banking magnates. (Anything sound familiar?) The main difference between that last century’s gilded moment and this one was that those robber barons built tangible things like railroads. Today’s equivalent crew of the mega-wealthy build remarkably intangible things like tech and electronic platforms, while a grifter of a president opts for the only new infrastructure in sight, a great wall to nowhere. In Twain’s epoch, the U.S. was emerging from the Civil War. Opportunists were rising from the ashes of the nation’s battered soul. Land speculation, government lobbying, and shady deals soon converged to create an unequal society of the first order (at least until now). Soon after their novel came out, a series of recessions ravaged the country, followed by a 1907 financial panic in New York City caused by a speculator-led copper-market scam. The leading bankers who had received that bounty from the government went on to cause the Crash of 1929. Not surprisingly, much speculation and fraud preceded it. In those years, the novelist F. Scott Fitzgerald caught the era’s spirit of grotesque inequality in The Great Gatsby when one of his characters comments: “Let me tell you about the very rich. They are different from you and me.” The same could certainly be said of today when it comes to the gaping maw between the have-nots and have-a-lots. Let’s break that down. If you earn $31,000 a year, the median salary for an individual in the United States today, your income would be that amount minus associated taxes (including federal, state, social security, and Medicare ones). On average, that means you would be left with about $26,000 before other expenses kicked in. If your wealth is $1,000,000, however, and you put that into a savings account paying 2.25% interest, you could receive about $22,500 and, after taxes, be left with about $19,000, for doing nothing whatsoever. Obviously, if you inherit wealth in this country, you’re instantly ahead of the game. In America, a third to nearly a half of all wealth is inherited rather than self-made. According to a New York Times investigation, for instance, President Donald Trump, from birth, received an estimated $413 million (in today’s dollars, that is) from his dear old dad and another $140 million (in today’s dollars) in loans. Not a bad way for a “businessman” to begin building the empire (of bankruptcies) that became the platform for a presidential campaign that oozed into actually running the country. Trump did it, in other words, the old-fashioned way — through inheritance. In his megalomaniacal zeal to declare a national emergency at the southern border, that gilded millionaire-turned-billionaire-turned-president provides but one of many examples of a long record of abusing power. Unfortunately, in this country, few people consider record inequality (which is still growing) as another kind of abuse of power, another kind of great wall, in this case keeping not Central Americans but most U.S. citizens out. The economy has been treading water ever since (especially compared to the stock market). Annual gross domestic product growth has not surpassed 3% in any year since the financial crisis, even as the level of the stock market tripled, grotesquely increasing the country’s inequality gap. None of this should have been surprising, since much of the excess money went straight to big banks, rich investors, and speculators. They then used it to invest in the stock and bond markets, but not in things that would matter to all the Americans outside that great wall of wealth. The question is: Why are inequality and a flawed economic system mutually reinforcing? As a starting point, those able to invest in a stock market buoyed by the Fed’s policies only increased their wealth exponentially. In contrast, those relying on the economy to sustain them via wages and other income got shafted. Most people aren’t, of course, invested in the stock market, or really in anything. They can’t afford to be. It’s important to remember that nearly 80% of the population lives paycheck to paycheck. The net result: an acute post-financial-crisis increase in wealth inequality — on top of the income inequality that was global but especially true in the United States. The crew in the top 1% that doesn’t rely on salaries to increase their wealth prospered fabulously. They, after all, now own more than half of all national wealth invested in stocks and mutual funds, so a soaring stock market disproportionately helps them. It’s also why the Federal Reserve subsidy policies to Wall Street banks have only added to the extreme wealth of those extreme few. The list of negatives resulting from such inequality is long indeed. 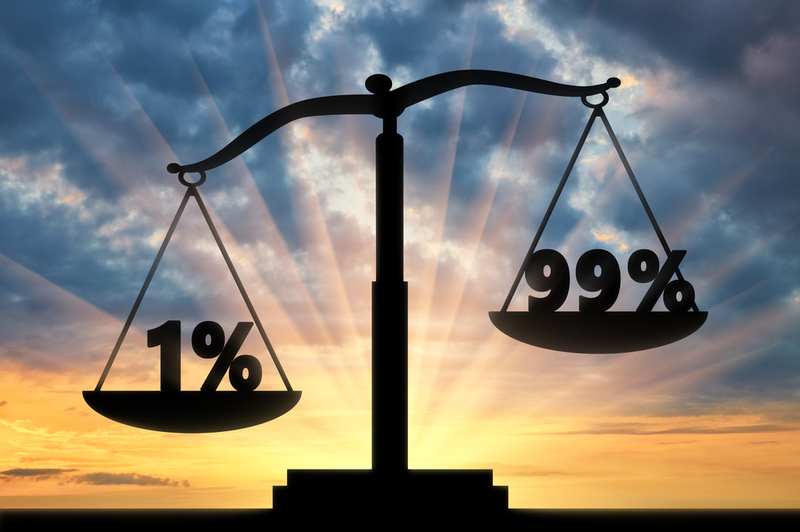 As a start, the only thing the majority of Americans possess a greater proportion of than that top 1% is a mountain of debt. The bottom 90% are the lucky owners of about three-quarters of the country’s household debt. Mortgages, auto loans, student loans, and credit-card debt are cumulatively at a record-high $13.5 trillion. Then there’s Social Security, established in 1935 as a federal supplement for those in need who have also paid into the system through a tax on their wages. Today, all workers contribute 6.2% of their annual earnings and employers pay the other 6.2% (up to a cap of $132,900) into the Social Security system. Those making far more than that, specifically millionaires and billionaires, don’t have to pay a dime more on a proportional basis. In practice, that means about 94% of American workers and their employers paid the full 12.4% of their annual earnings toward Social Security, while the other 6% paid an often significantly smaller fraction of their earnings. According to his own claims about his 2016 income, for instance, President Trump “contributed a mere 0.002 percent of his income to Social Security in 2016.” That means it would take nearly 22,000 additional workers earning the median U.S. salary to make up for what he doesn’t have to pay. And the greater the income inequality in this country, the more money those who make less have to put into the Social Security system on a proportional basis. In recent years, a staggering $1.4 trillion could have gone into that system, if there were no arbitrary payroll cap favoring the wealthy. The billionaires’ club is where it’s really at, though. According to Oxfam, the richest 42 billionaires have a combined wealth equal to that of the poorest 50% of humanity. Rest assured, however, that in this gilded century there’s inequality even among billionaires. After all, the 10 richest among them possess $745 billion in total global wealth. The next 10 down the list possess a mere $451.5 billion, and why even bother tallying the next 10 when you get the picture? In sum, the rich are only getting richer and it’s happening at a historic rate. Worse yet, over the past decade, there was an extra perk for the truly wealthy. They could bulk up on assets that had been devalued due to the financial crisis, while so many of their peers on the other side of that great wall of wealth were economically decimated by the 2007-2008 meltdown and have yet to fully recover. What we’ve seen ever since is how money just keeps flowing upward through banks and massive speculation, while the economic lives of those not at the top of the financial food chain have largely remained stagnant or worse. The result is, of course, sweeping inequality of a kind that, in much of the last century, might have seemed inconceivable. Eventually, we will all have to face the black cloud this throws over the entire economy. Real people in the real world, those not at the top, have experienced a decade of ever greater instability, while the inequality gap of this beyond-gilded age is sure to shape a truly messy world ahead. In other words, this can’t end well. Nomi Prins, a former Wall Street executive, is a TomDispatch regular. Her latest book is Collusion: How Central Bankers Rigged the World (Nation Books). She is also the author of All the Presidents’ Bankers: The Hidden Alliances That Drive American Power and five other books. Special thanks go to researcher Craig Wilson for his superb work on this piece.